Fexofenadine is an anti-histamine used to treat symptoms associated with hay fever and allergy. Hay fever is condition that affects around 20% of people in the UK. It is caused by the body's reaction to pollen, a fine powdery substance that is produced by flowers, trees, grass and weeds. Pollen counts are higher in summer months, and can cause symptoms such as sneezing, coughing, watery or itchy eyes, a blocked or runny nose, headache and difficulty breathing. These symptoms occur when pollen makes contact with the eyes, nose mouth and throat. Fexofenadine works to prevent or reduce these symptoms. When pollen or other foreign substances that cause allergies, come into human contact, the body releases histamine. The histamine released then binds to histamine receptors, which cause symptoms associated with hay fever and allergy, such as sneezing, runny nose and watery or itchy eyes. Fexofenadine works by blocking histamine receptors, so that histamine is unable to bind to them. As histamine is unable to bind to receptors, hay fever symptoms do not occur. You should take one tablet on an empty stomach. Tablets should be swallowed with a glass of water. You should not take indigestion medication two hours before or after taking the tablet, as this can make it less effective. For those that suffer with long-term hay fever, you should take one tablet every morning before breakfast. What dose should of fexofenadine should I take? The recommended dose for adults experiencing hay fever or allergy is 180mg once daily. For those experiencing mild symptoms of hay fever or allergy, a 120mg tablet can be taken. If you miss a dose, you should take it when you remember. If you remember when it comes to taking your next dose, you should not take two tablets together. Missing one dose is unlikely to have a negative impact on the long-term treatment of hay fever. You should take one as required, when treating symptoms associated with short-term allergy. If your allergy symptoms persist over a long period of time, for example the whole summer, you are able to safely take one tablet ever yday. If you accidently take more than one tablet a day, you should be fine. Fexofenadine is generally considered to be very safe, and taking more than one tablet on the same day is unlikely to cause any harm. You may experience symptoms such as dry mouth or drowsiness, but these side-effects will pass. Will fexofenadine make me feel drowsy? Fexofenadine is a non-drowsy antihistamine, and is unlikely to make you feel drowsy. However, medications can affect people in different ways, and there is a slight possibility that you may experience drowsiness. You should take a tablet to assess your response, and avoid driving or operating machinery if fexofenadine causes you to feel drowsy. Can I take fexofenadine with other medication? You may still be eligible to use fexofenadine, but you may need to use the lower strength tablet. If you are taking indigestion remedies, you should take fexofenadine at least two hours before or after your medicine for indigestion. This is because indigestion remedies can reduce the effectiveness of fexofenadine. Can I use fexofenadine if I have a medical condition? You may need to use a lower strength of fexofenadine. Can I take fexofenadine if I am pregnant or breastfeeding? Traces of fexofenadine are present in breast milk. Although traces are not thought to cause any harm to the baby, women who are breastfeeding are still advised not to use fexofenadine. Antihistamines should not be used by pregnant women, unless under the advice and supervision of a doctor. There is no known interaction between alcohol and fexofenadine, but a combination of both can cause you to feel sleepy. Is there anything I am not able to eat or drink? Fruit juices such as grapefruit, orange and apple juice should be avoided as they can reduce the effectiveness of fexofenadine. What is the difference between fexofenadine, Allegra and Telfast? Telfast and Allegra are branded medication, that contain the active ingredient called fexofenadine. There is no difference between any of the formulations, as they all contain the same active ingredient. 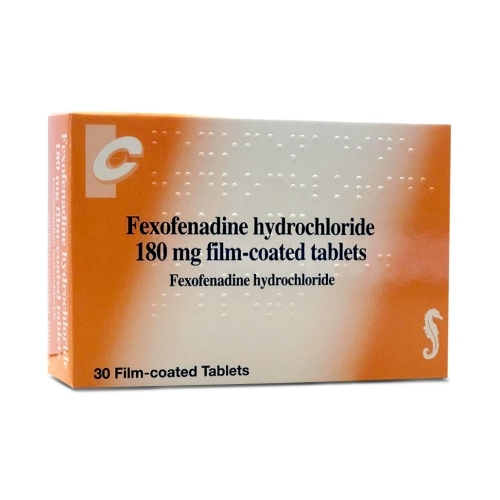 You can order fexofenadine tablets online from Chemist Click at a much cheaper price. How can I order fexofenadine? 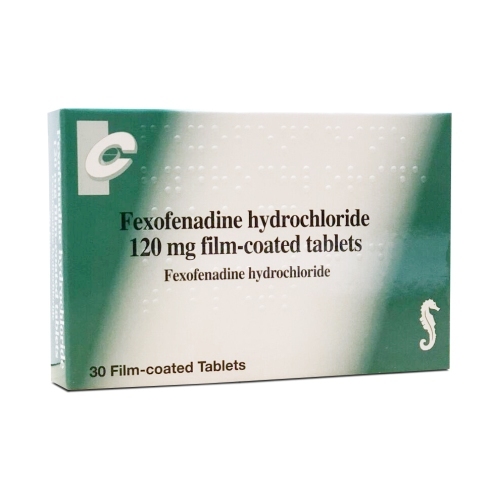 You can buy fexofenadine online after choosing the strength and quantity of tablets you require. You will need to complete a short series of medical questions, that should not take more than 2 minutes. After this, you will be able to checkout, and your order will be dispatched from our regulated pharmacy, using a next day delivery service.